Growing up in the 1950s was not Ozzie & Harriet and Father Knows Best for Linda C. Wisniewski. Unlike the characters on her favorite TV shows, Linda learned to be quiet, atone for the sins of others, and just plain suffer as a way of life. Only when she came to terms with her Polish Catholic heritage, her physical deformity, and her widowed mother did she find inner peace and the keys to her own happiness. Readers of Angela's Ashes and The Joy Luck Club will enjoy this mother-daughter saga from sorrow to love. 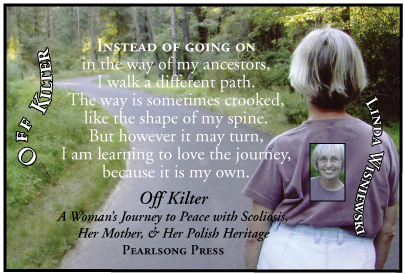 Author Susan Wittig Albert calls Off Kilter "a splendid first memoir about the difficult business of finding balance in our lives. Funny, honest, deeply moving, Off Kilter reminds us just how hard it is to adjust to the physical pain, the emotional loss, and even the surprising beauty of being fully who we are." 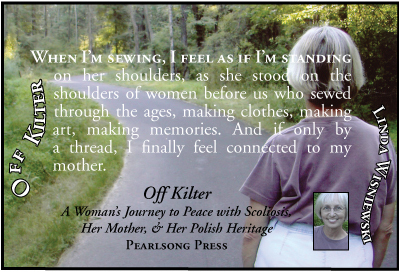 "Off Kilter opens a window into a woman's life as she comes to peace with her Polish ancestry, her mother's depressive behavior, and her own scoliosis, a side-to-side curvature of the spine, discovered when she was thirteen. Linda Wisniewski weaves the threads beautifully together, sometimes on a slant, as she leads the reader into the compelling story of a survivor. After a few pages, the reader is captured by the author's voice―both heartfelt and perceptive, that of a friend―and by the narrative itself. "Wisniewski's memoir is a tapestry, each thread connecting back to memories of her Polish Catholic childhood in a postwar mill town in upstate New York―the two-story clapboard houses, the polka weddings, the house full of talking relatives, the best kielbasa from the Polish butcher―struggling to find herself in the midst of her father's torments, her mother's tears, and the discipline of the Sisters at school, their voices cold as ice. "The broken yardstick from her mother's sewing becomes the talisman of her life. 'The yardstick resembles my life; it has broken parts. Nothing has been a straight line from here to there.' Her back has been twisted by scoliosis. Her body and life have been off kilter. But the yardstick, mended and carefully glued back together, is now hers. It measures her struggle to stretch not only her spine but also her Self. "Bravo for this well-written, well-conceived memoir. The many different scenes of Wisniewski's life are beautifully described―specific details that the reader sees, touches,and feels. And always with honesty and integrity." "....compelling....highly recommended for community library memoir collections." "Writing in a style reminiscent of Frank McCourt, Wisniewski conjures the ghosts of a troubled and emotionally fraught childhood throughout the majority of her memoir so that she can exorcise them in the final chapters....Expertly balancing pathos and triumph, Wisniewski never wallows in self-pity. Rather, she gathers strength from her setbacks and finds a renewed sense of purpose with each curve life sends her way. In this sense, Off Kilter is a fine testament to the resilience of the human spirit and to the healing power of the written word." "Wisniewski comes to terms with her 'off kilter' life by revisiting in vivid images a childhood that insisted 'suffering is good.' Readers with very different histories will recognize their own struggles against forces that threaten to cripple them, and will be heartened by Wisniewski's journey to understand and forgive, to heal and make peace, and to create and live a new life." "This splendid first memoir is about the difficult business of finding balance in our lives. Funny, honest, deeply moving, Off Kilter reminds us just how hard it is to adjust to the physical pain, the emotional loss, and even the surprising beauty of being fully who we are. Kudos to Linda Wisniewski!" "Many memorists are asked by family members, 'Why are you bringin' this up now?' 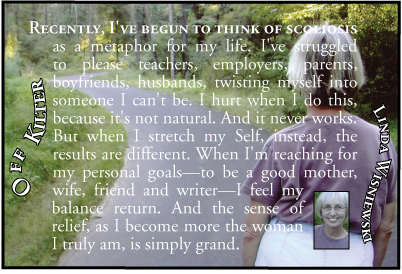 In Off Kilter, Linda Wisniewski succeeds in answering this question. Exploring her Polish Catholic heritage in upstate New York with an emotionally distant mother and constantly feeling off balance from the shape of her spine, Wisniewski stretches herself emotionally and spiritually as an adult to find solid ground to stand on. A courageous insightful book, particularly relevant for anyone who grew up feeling physically 'different.'" "After darkness comes light, and in Off Kilter Linda Wisniewski takes us on her personal journey to overcome her challenging past to emerge a balanced, compassionate woman." 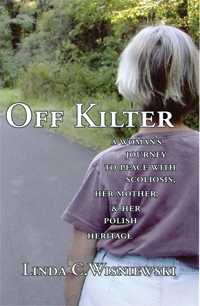 "Off Kilter is one woman's testimony to the effects of childhood abuse, which left her 'off kilter' in more than one way. Her spine was not straight but her heart and mind were always on a sight-line to what is right, what is good, and what is redeeming in the human heart. Linda writes with candor and honesty about her healing journey to forgiveness and wholeness, and the blessings of a life that is heart-centered. Everyone should read this lovely book!"